Located about an hour outside London in the countryside county of Sussex, Spring Farm Alpacas is home to dozens of South American alpacas. The farm nurtures and raises these furry friends, and sheers them for their extremely soft fur. Each alpaca is memorable for its own unique name, ranging from Hermione to Picasso. Walks with the alpacas are available every day of the week, but must be prearranged with a minimum of 2 people per booking. Walks last about 45 minutes, and cover about a mile of scenic pasture. Spring Farm Alpacas now offers alpaca walking around our beautiful farm in East Sussex. Situated in the High Weald Area of Outstanding Natural Beauty, Spring Farm is superbly located adjacent to the Ashdown Forest, Bluebell Railway, Sheffield Park and the historic village of Fletching. 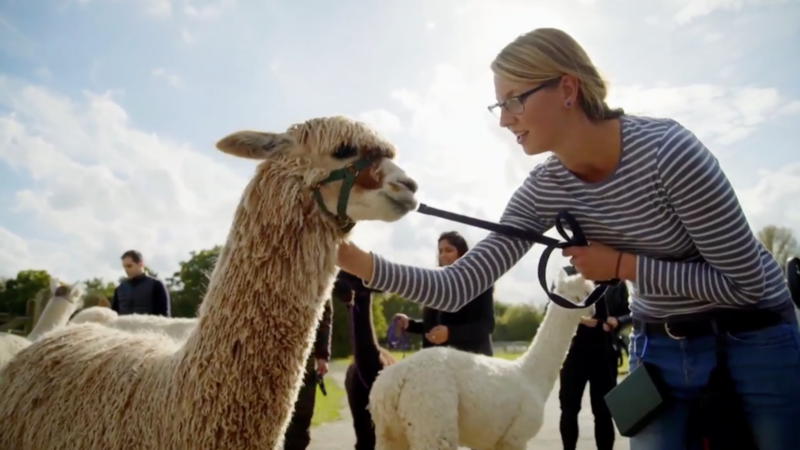 Alpaca walking is huge fun for everyone – not just our alpacas! Alpacas are delightful and friendly animals and ours all know their names. Everybody who comes to our farm for an alpaca trek comments on how relaxing our alpacas are to be around. Costs: 25 per alpaca walk per person, 10 per accompanying person not walking an alpaca. Spring Farm Alpacas now offers a fully furnished spacious one bedroom holiday let. Recently completed, “The Lodge” offers luxury self catering on a working alpaca farm. The Lodge has one bedroom with king size bed, shower room/toilet and a fully equipped kitchen/lounge area complete with single sofa bed, large flat screen TV, Blu-ray/DVD, wi-fi and iPod dock. Tastefully decorated, fully double glazed and centrally heated, The Lodge is perfect for peace and tranquillity whilst maintaining every creature comfort. Spring Farm Alpacas offers a number of workshops here at Spring Farm Alpacas. You can find more info about workshops here. Spring Farm Alpacas are active on the UK Alpaca Show circuit. The Shows we regularly attend are the BAS National, South of England (which we help organize) and the Heart of England Spring Fiesta. You can find more info about shows here. If you want to get a feel for what's involved in alpaca ownership, Spring Farm Alpacas offers husbandry days. These days are free and are run throughout the year. Find out more here.